Virginia’s WDBJ7 TV reporter Alison Parker and cameraman Adam Ward have been shot dead during a live report in the town of Moneta. Alison Parker, 24, and Adam Ward, 27, were killed during an interview, the TV station said. A man, apparently a disgruntled former employee of WDBJ7 TV, uploaded a video of himself shooting the reporter at close range on social media. Augusta County Sheriff’s Office has named the suspect as Vester Lee Flanagan. Known professionally as Bryce Williams, Vester Lee Flanagan is a former WDBJ7 staff member and described by police as a “person of interest”. His Twitter and Facebook accounts have now been suspended. 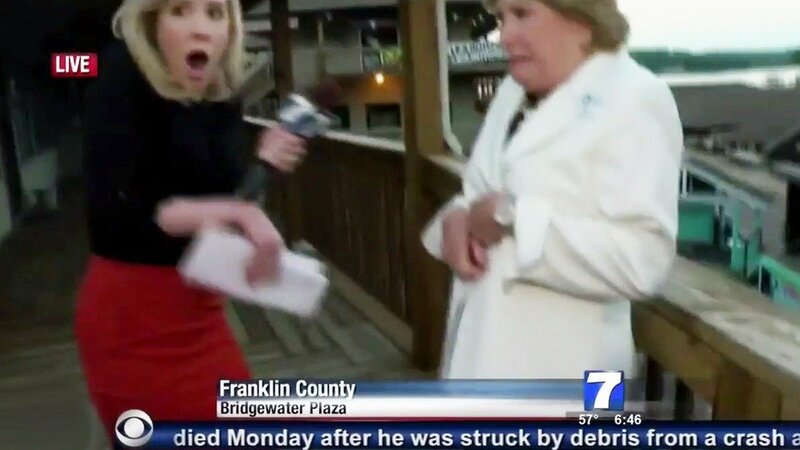 During the live broadcast, shots and Alison Parker’s screams could be heard, and the camera fell to the ground. State police have denied reports that a pursuit is under way. The attack took place at a large shopping centre, Bridgewater Plaza, near Smith Mountain Lake. Alison Parker was starting a breakfast TV interview about tourism at the shopping centre when suddenly eight shots rang out, the camera spun and dropped to the ground, and her screams could be heard. The footage then captures what appears to be a fleeting image of the gunman, who is wearing black trousers and a blue top – and holding a handgun. The station said the woman who was being interviewed, Vicki Gardner of the Smith Mountain Lake Regional Chamber of Commerce, had survived the attack but was in hospital and required surgery. “Alison and Adam died this morning at 06:45 shortly after the shots rang out. We do not know the motive or who the suspect or the killer is,” the station’s president and general manager, Jeffrey Marks, announced on air. “I cannot tell you how much they were loved by the WDBJ7 team… our hearts are broken,” he said. Jeffrey Marks added that the station’s building was in lockdown, under police protection. “Police have advised us that as long as this person is on the loose, we should stay in the building. We have police protection,” he told the Associated Press news agency. WDBJ7 anchor Chris Hurst revealed that he and Alison Parker had been in a relationship and had planned to marry. “We didn’t share this publicly, but @AParkerWDBJ7 and I were very much in love. We just moved in together. I am numb,” he said on Twitter. “We were together almost nine months. It was the best nine months of our lives. We wanted to get married. We just celebrated her 24th birthday. Chris Hurst added that Alison Parker had worked on a regular basis with Adam Ward, and that he was heartbroken for his fiancée, a producer at the station.